If you can see from the cover photo of this article, the highlights and page markers were A LOT on this one because of those moments. Below you will find the top 4 insights I got out of the book, and these are the ideas that really hit me best. But those four insights are only a sliver of the ideas, thoughts, and value this book holds. In fact, if you’re like me, you would initially think that “being original” is only limited to the work of a creative – someone that has to consistently think up new ideas for projects. But after reading the first few chapters, you’ll understand that it isn’t. 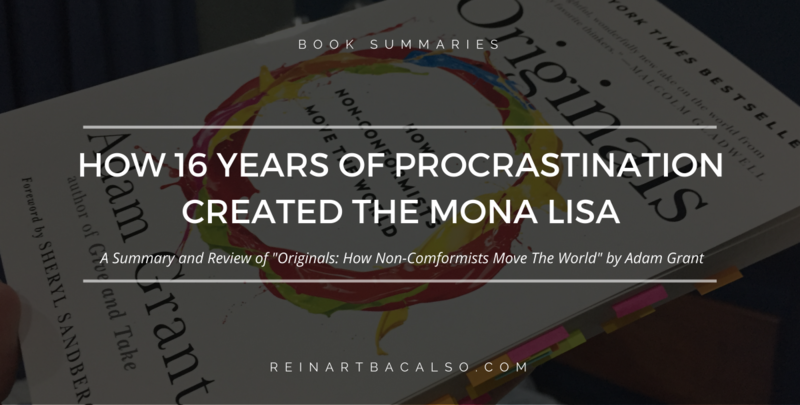 With multiple historical anecdotes that we don’t really hear of (like how Da Vinci procrastinated by starting on the Mona Lisa on 1503, and choosing to finish it on 1519), Adam does a great job citing history and scientific studies on how being original applies in the entirety of what we experience in life – not just work – and how you can actually do the same! Topics span from human psychology, business, communication, managing emotion, leadership, ideologies, movements (and even parenting!) – you name it and it’s probably covered in this book one way or another. The key is that they all revolve around the central theme of being original and how it doesn’t only positively impact your life – but the lives of the people around you as well. When people feel safe, they would rather take a guaranteed win over a risky win. When people feel uncertain, they would rather take a chance towards a loss than a guaranteed loss. Meaning, when people feel uncertain, and you show them two situations and one is guaranteed loss (like there’s a sure negative effect), when you show them a situation that still has some negative effect but it is predicated by chance and not certainty, people would rather take the chance of a loss compared to the guaranteed loss. This is our innate human tendency towards “loss aversion”. How does it apply to marketing and advertising? When marketing to people who already feel “safe” (customers, subscribers, etc. ), it is better for you to highlight benefits (guaranteed wins) compared to highlighting what they might lose if they don’t take action (guaranteed losses). But when marketing to people who don’t know you and naturally see you as “risky” (which is 90% of our marketing/advertising), it is better to highlight what they’ll lose (guaranteed losses) if they don’t take action, compared to highlighting wins (guaranteed wins). In riskier situations, the average person would rather take the chance to lose than taking a sure loss from not taking action. Clicking on an ad, subscribing to an email list, buying from you, etc., are all chances for a new visitor to lose (but not guaranteed) since they don’t know of your track record yet. You might scam them, use their emails maliciously, never send them their purchased products, etc. That’s why in advertising/marketing to new people, it’s better to highlight what they will lose if they won’t take action, compared to the benefits of taking action, so that they would be moved to take the chance to lose – which in this case, is taking action towards your marketing message and offer. Groupthink is when a team becomes passive and members just agree to what fellow team members say. It’s the overall tendency to foster blind agreement instead of inviting thoughtful disagreement. It bears a negative effect on the performance of a team as a whole, as people who have novel ideas fall under the pressure of the group’s thinking. You would think that the best way to avoid groupthink is to build a strong company/organizational culture. This way, everyone is on the same page and you all work together like a charm. Everyone works the way they’re supposed to, and you trust that the job will get done because you’ve built a “strong culture”. Adam brings together multiple studies that back the following idea. It’s important to be grounded by values and principles as a team, but there’s an important caveat: these values must promote individuality, and the principle of “culture building” – even if that means people bring up bad ideas. In fact, Adam mentions that opinions are important even when they’re wrong. If your entire team/organization has such a strong culture, and you all believe the same things, you’re less likely to see what’s going wrong inside the team, hence you will be less likely to fix it. People who “build culture” are those that value principles for a company, but also see the importance of challenging the status quo regularly to make sure the team continues to move forward and doesn’t turn complacent. What’s the common denominator between a man who would spend all his money on a car and leave nothing for gas to move around the city quicker – and a company that spends 90% of their resources on hiring, creating systems, building architecture (the car) without first focusing resources on getting paying customers (the gas)? They’re both not getting anywhere soon. Some of the best companies fail because they prepare for growth that isn’t there yet. There’s a delicate balance between being prepared and being over prepared. Spending resources to be ready for your next “1,000 customers” when they aren’t even there to pay you yet and especially when you don’t even have a plan to get those 1,000 customers yet, will lead you to failure. Instead, it’s much better to retrospectively build as you grow. Of course it’s important to be proactive, but from what I understand from the book – it’s better to be proactive in strategy (meaning you’re ready with what you plan to do) than implementation and execution (what you’re going to actually do today). These are situations we face day to day, and we still go ahead and procrastinate no matter how much we know of the consequences. But, as Adam Grant emphasizes in the book, there are actually benefits that come out of procrastinating! Before you celebrate – there’s a catch though. It’s important that you’re intrinsically motivated to solve the problem at hand and you’ve done some work before you start the procrastination. For the first point, it’s applicable in a general sense. If you don’t feel deeply, emotionally rooted to a project and it’s “why”, you aren’t going to do jack-squat about it. (I recommend reading through Simon Sinek’s material on Starting With Why. Watch his amazing TED Talk here). On the second point, to take full advantage of the benefits of procrastination (which I’ll get into in a sec), when you receive a task/project/to-do, you HAVE to start on it. Even if it’s just a bit! Read the project requirements, the overview, give it some actual thought. They key comes in the period in between the start of your task, and the moment you end your procrastination and actually try and finish it. While procrastinating, it’s in this time that you allow yourself to engage in divergent thinking. Studies highlighted in the book showed that by delaying progress on the completion of a project, you are more likely to consider different ways to approach it through experiences outside of the project’s domain. In fact, Da Vinci himself procrastinated for 16 years – he started on the Mona Lisa on 1503 and completed it on 1519! Procrastination allows you to become more creative and opens up your mind to implementing ideas outside the usual course of action to whatever project you’re working on. That’s it! Those are the 4 things that stood out to me the most in this book. Like I mentioned in my Book Reviews page, I started reading again to refuel my creativity and drive. I’m SUPER HAPPY that this was the book I chose to start that with. You’ll get so much inspiration and “a-ha!” moments to apply, that your creative juices will get flowing before you know it. I highly recommend this book, and it’s definitely worth the pick up. You can find it on Amazon or your local bookstore. Fully Booked Cebu has copies when I last checked (May 26, 2017). Did you get some of your creative juices flowing while reading this? Let me know in the comments below! Jumped all the way to the bottom and skipped all my writing, huh? 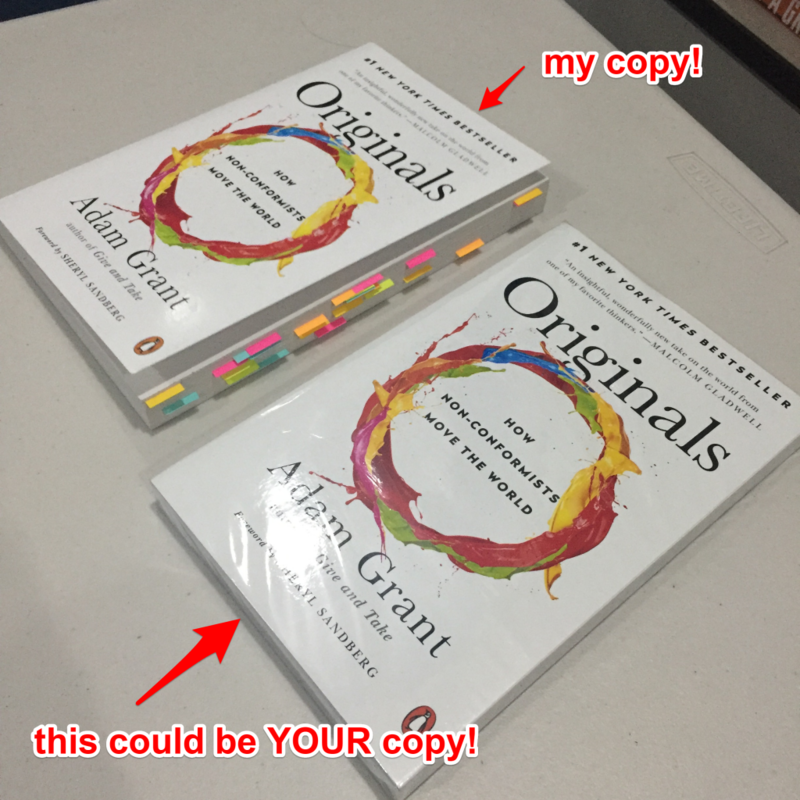 Want to win a brand new copy of Originals for free? It’s pretty simple. There should be a red button somewhere at the bottom of your screen which you can click. All you have to do is enter your name and email to join the giveaway. This includes free shipping, should you win and we can’t personally meet. Also, by entering this contest you agree to hear about the next monthly giveaway, future book summaries, and other articles every now and then through email. If that’s cool with you, go ahead and join the contest. Submissions end on May 31, 2017 11:59PM. I’ll be emailing you if you win – so look out in your inbox. Now go finish reading the entire post, you sly rebel. Great review, Reinart. I specifically like your third point which is How companies buy cars without leaving money for gas. It made me think and reflect on my own personal business as I plan to venture in creating my own firm soon. Thanks a lot! Thanks, Fran! Yeah – it’s something I had to overcome after a while too. Remember us spending on a website and all before? That was the perfect example of this analogy now I think about it. HAHAHAHAHA.